New India Assurance successfully conducted NIACL AO Exam 2016. The total number of aspirants who attempted the paper this year is way more than last year’s examination. You will be glad to know that our experts went at several NIACL Exam centres to bring you a LIVE and an honest NIACL AO Exam Analysis just like we do for all the important competitive exams. Apart from asking the students directly about their stance on NIACL AO Exam Analysis, we have also made sure to include valuable inputs from previous year students. The 2nd slot of NIACL AO Preliminary exam 2016 was conducted from 12:00 PM – 1:00 PM. We are now going to share the detailed analysis of this slot. No. Time could be managed with some planning. Two of our experts visited some of the NIACL AO exam centres and spoke exclusively with the students who appeared for the exam. Their inputs were taken into consideration. Various previous year students (who qualified the exam last year) gave in their feedback on this year’s exam and that too was taken into consideration. Lastly, a few experts from NIACL itself were consulted and the final NIACL AO Exam Analysis was conducted. Q2. How is the NIACL Exam Analysis useful to candidates ? A2. NIACL AO Exam Analysis is useful in that it can be used as a source of reference for future attempts as well as future aspirants. It gives a rough estimate to aspirants about the overall attempt in the examination. Candidates get aware of the potential competition in the examination. 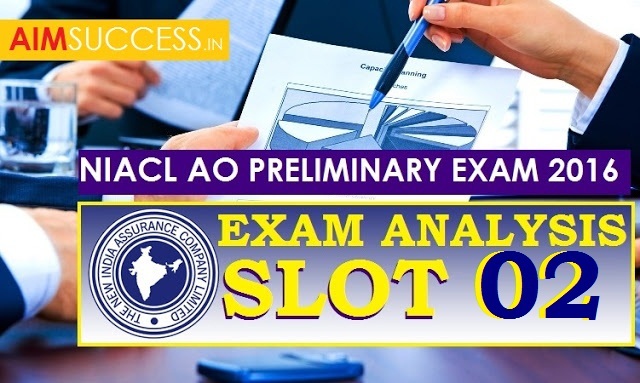 If you have any queries or doubts related to NIACL AO Exam Analysis 2016 or want to know about your chances of qualifying the exam, feel free to post your expected score and level of accuracy in the comments sections below. We’ll make sure to let you know your status. If you want to receive the fastest updates on all ongoing and forthcoming exams, do subscribe for our website by leaving your email in the pop up that comes on your screen when you visit our website. You will get instant updates in your inbox and will remain aware of all the events concerning the ongoing exams.